Check Out Our Brand-New Morgan Silver Dollar eBay Sales Chart - It's Easy & Free to Use! Here at Coin Values, we’ve been working hard to unveil a new site feature that we think you’re going to love. It’s the eBay coin sales chart, and it gives you updated price data for all types of coins sold on the popular auction site. We’ve decided to release this amazing new module for Morgan silver dollars first, which are among the most widely bought and sold coins in the coin collecting and bullion investment markets. Using the new Morgan silver dollar sales chart is really simple. 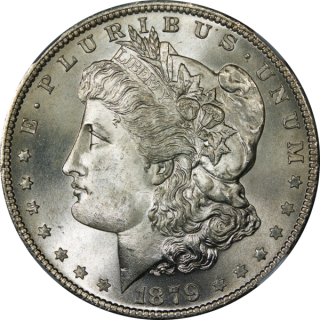 In fact, we’ve broken down eBay coin sales data for each year of the Morgan dollar series, giving you easy access to the latest price information for the very coins you’re interested in buying, selling, and learning more about. All you need to do to use our informative sales chart is to click on any year Morgan dollar listing on our Morgan silver dollar hub. After you’ve clicked on a certain year, scroll down below the coin data text and you’ll see a rundown of Morgan silver dollars sold on eBay and dated for that year. For example, if you check out our 1893 Morgan silver dollar data, you'll see our eBay coin sales chart shows that the most expensive 1893-dated Morgan dollar to sell on eBay over the past couple months was an 1893-S AU Morgan dollar that sold for $9,911 on August 15, 2014. The most expensive 1893-CC Morgan silver dollar was a PCGS-graded MS 62 coin that traded hands for $8,250 on September 5, 2014. Using this tool is a great way to easily find out what the most valuable Morgan silver dollars are, and also to learn how much your Morgan silver dollars may fetch if you offered them for sale on eBay. Researching with our Morgan silver dollar values tool is also an excellent way to determine how much you may need to pay to buy the coins you want for your collection or investment portfolio. We hope that you like this new feature and encourage you to check back often to get the latest Morgan silver dollar values. We’re continuing to expand Coin Values each week and look forward to offering you more of these valuable tools and coin price data soon!